Use driftwood and a starfish to create a simple but stunning piece of art for your shelf, mantle or wall. Start by painting your wood panel or shadowbox. The outer edge should be white while the very back should be grey. Allow to dry completely before continuing. Use a saw to cut your driftwood pieces to size. (Remember to follow all safety precautions and use your safety gear when using power tools.) This is like a puzzle. Try different combinations until something fits well and works for your piece. No two pieces of driftwood are the same but that is the beauty of it. Use hot glue to secure everything into place. First add the driftwood to the back of the box then the starfish on top. 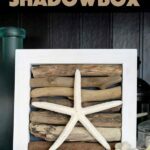 Choose a shadow box or other wood frame with a recess for your driftwood. Choose driftwood pieces that are slightly longer than your wood panel. The gray craft paint in the back of your box will make areas between the driftwood dark. Use a very dry brush and very little paint when adding the white to give a slightly rustic appearance. Always be careful when using power tools and follow all manufacturer’s instructions and safety precautions. This project for Driftwood Art with a Starfish was printed from CraftsbyAmanda.com - https://craftsbyamanda.com/driftwood-art/ and can only be printed for education or personal use.